The Samsung Galaxy Note9 is crammed with amazing features. Enjoy lots of storage, an incredible 6.4-inch display, and a cracking camera that takes great photos even in low light. The all-new Bluetooth S Pen lets you control your phone from up to 10 metres away, take faraway photos, conduct presentations, do some jotting, and so much more. “A powerful smartphone with a big screen that’s ideal for watching movies and getting work done on the go. The all-new Bluetooth S Pen lets you control your phone from a distance and is full of funky new features, making the Note9 easy to navigate." Meet the phone made to keep up with you. Our reinvented Bluetooth enabled S Pen allows you to control features remotely up to 10m, while an impressive 128GB or 512GB of internal storage means you'll never run out of space. Plus, our most powerful battery yet will keep going as long as you need. Lose yourself in a large 6.4" screen with absolutely nothing to interrupt your view. If you're into movie marathons or boxset binges, the Infinity Display was made for you. Plus, it's easier to multi-task between tabs, split the screen or fully focus on an important presentation. The possibilities are infinite. The Note9 doesn't just capture scenes, it sees them. Its built-in Intelligent Camera detects your surroundings and adjusts settings accordingly. So whether you're shooting a dark sunset on the horizon or a bright portrait close up, you'll always snap perfectly balanced and detailed shots that are worthy of a professional. With a battery that charges faster and lasts longer, the Note9 is up for whatever you are. Whether you've got back-to-back meetings or you're heading off on an adventure without a socket in sight, the Note9 can keep up with you. Less down-time waiting for your device to catch up and a long-lasting battery that will help you power through. Nobody wants to miss out on a great shot because their device memory is full. And where do you start in deciding what to delete to free up space? 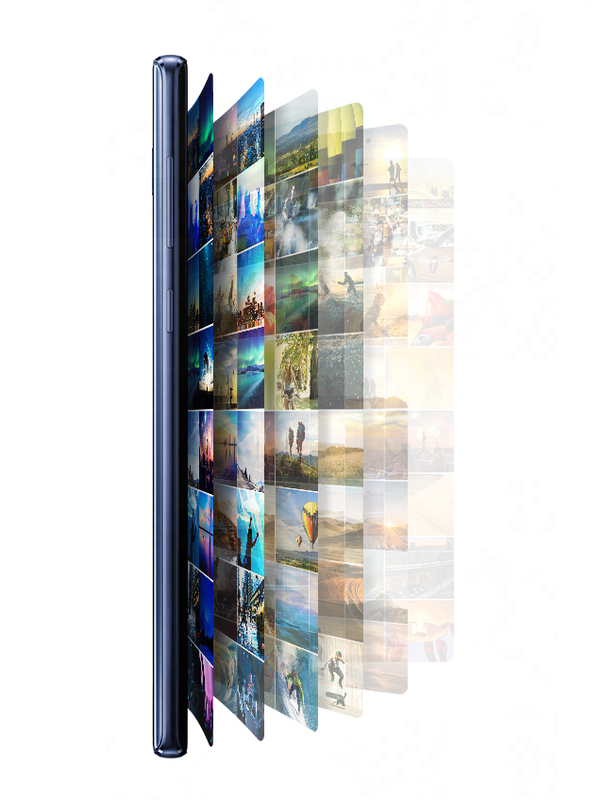 Thanks to a huge 512GB of storage, you can snap away on the Note9 with no worries. From selfies, to eBooks to chunky 4K videos, store it all safe and sound without having to delete any of your favourites. You can even top it up with additional external memory* with a micoSD card to ensure you'll never run out of room again. No matter how much your phone can do, sometimes you just need a PC to get the job done. That's why the Note9 can be transformed to power a desktop like experience. With just a single cable you can connect your Note9 to a monitor, Bluetooth keyboard and mouse* - perfect for typing up and reviewing documents or even responding to your phone notifications on the big screen. How long does the battery last on the Samsung Galaxy Note 9? The Samsung Galaxy Note 9 comes with a 4,000mAh battery with support for Fast Charging and Fast Wireless Charging. 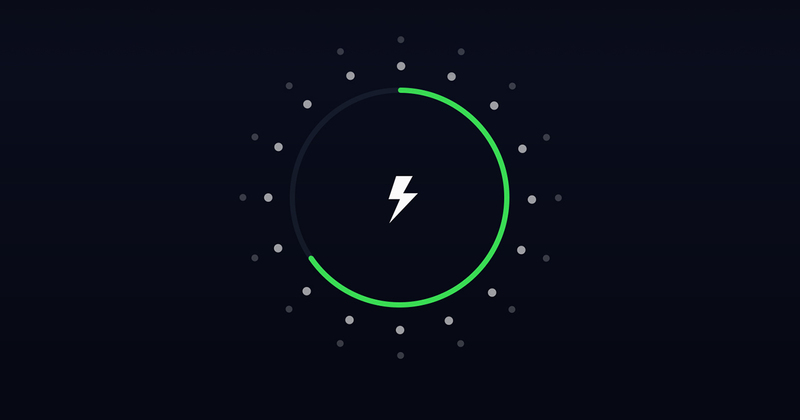 The new and improved battery should last all day from one charge with extensive use. So if you’re a moderate user, you might even squeeze a little more from it. How long does it take to charge the Samsung Galaxy Note 9? How good is the camera on the Samsung Galaxy Note 9? The Samsung Galaxy Note 9 has one of the most powerful cameras on the market. With low-light and telephoto-zooming camera lenses on the back, it’s a great option for photo buffs. The dual 12 megapixel camera uses clever dual aperture technology to switch between f/1.5 for low-light photography and f/2.4 for normal lighting conditions. What this means is that you’ll not need to worry about the environment you’re shooting in, the Galaxy Note 9 will automatically detect the light conditions and adjust the camera to make sure you get the best photo possible. 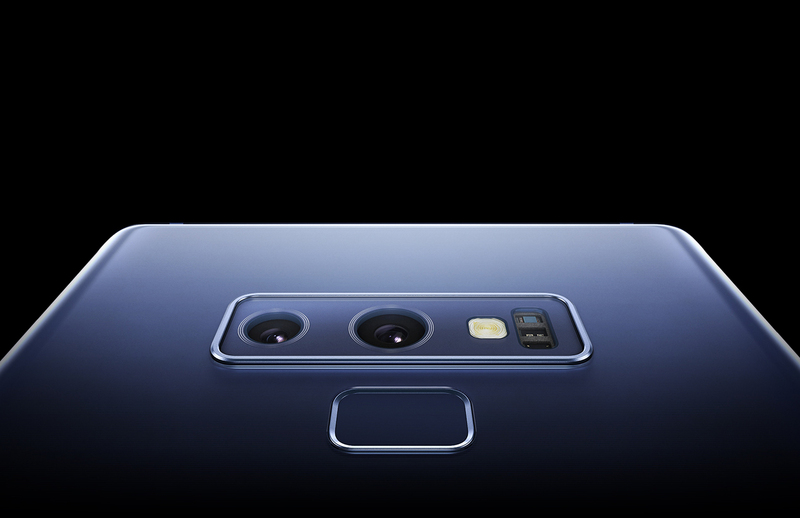 The Note 9 also boasts 2x optical zoom, giving you sharp snaps, even when you’re far away from your subject. Add to that the optical image stabilisation, and it means you’ll get near-perfect snaps no matter how shaky your hands are. The front-facing camera is great for selfie-taking, sporting 8 megapixels and autofocus it’ll make sure you get the right shot, every time. 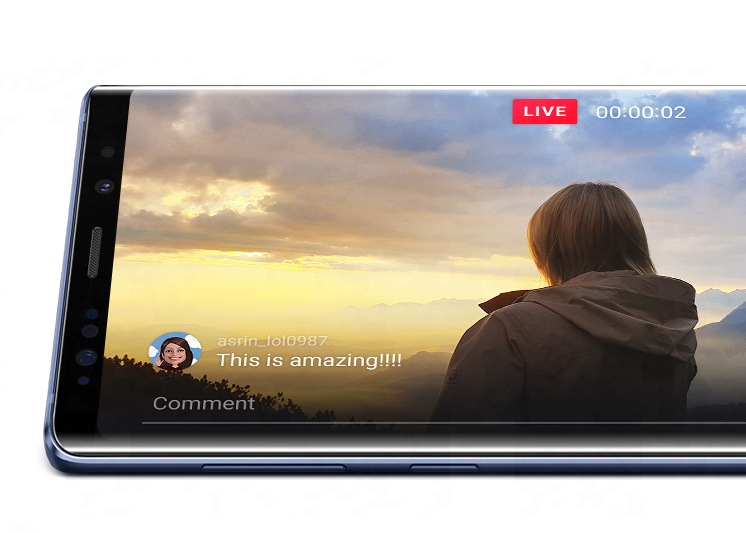 The camera app also comes with a wider variety of added extras too – whether that’s adding stickers, augmented reality filters, group selfie mode or slow motion video capture – there’s plenty to keep you entertained. Does the Samsung Galaxy Note 9 come with a stylus? 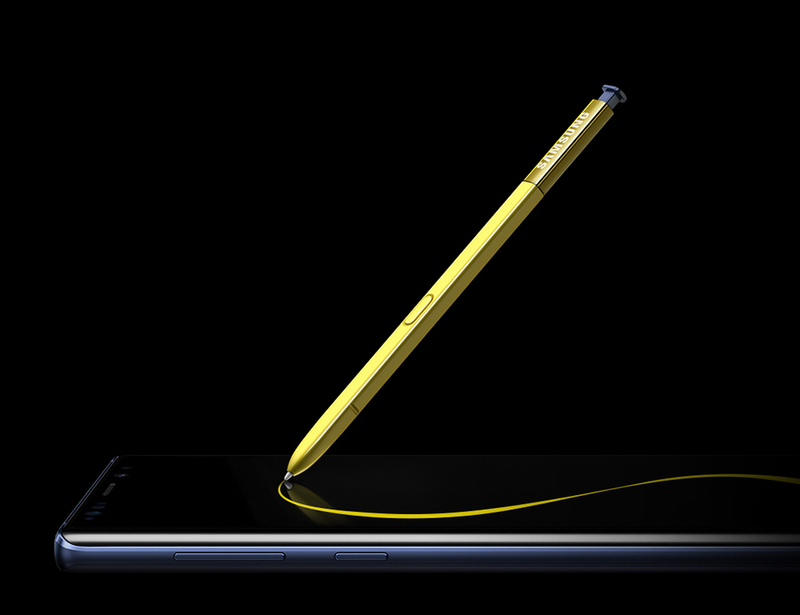 Yes, the Note 9 comes with the re-designed S-Pen. Bluetooth enabled, you can use it away from your phone as well as on it. With a range of up to 10 metres, you can use the S-Pen to perfect your selfie game or as a handy presentation clicker for meetings, or simply showing off your holiday snaps. The choice is yours. Does the Samsung Galaxy Note 9 work with DeX? 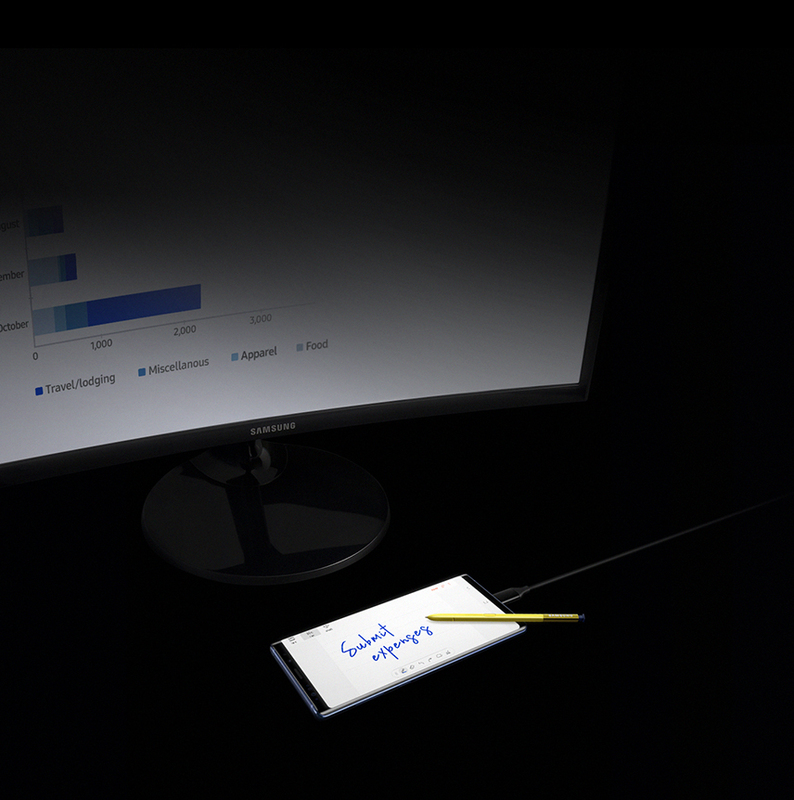 The Samsung Galaxy Note 9 works seamlessly with the Samsung DeX, a device that provides a desktop-style environment that you can project to a monitor using a USB or HDMI cable / adapter. With the new and improved S-Pen and larger screen on the Note 9, coupling it with the DeX enables users to turn their handset into a desktop-style computing experience without the need for a mouse or keyboard (although there is support for both). What is the difference between the Samsung Galaxy Note 8 and the Samsung Galaxy Note 9? Display: At first glance the two devices look similar, but on closer inspection you’ll notice that the Samsung Galaxy Note 9 is slightly bigger than its predecessor. At 6.4-inches, the Note 9’s screen is the biggest display that Samsung has ever fitted in its premium range, the Note 8 falls just short at 6.3-inches. Sensors: The other noticeable difference is the fingerprint sensor, it’s been moved below the rear cameras to bring it in-line style-wise with the flagship Galaxy S9. The Samsung Galaxy Note 9 does also come with ‘Intelligent Scan’ facial recognition software, something that wasn’t included on the Note 8. 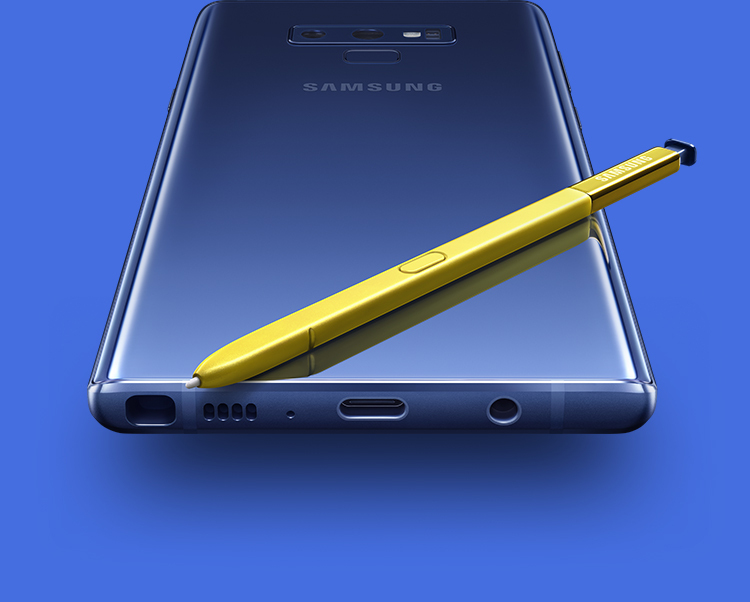 S-Pen: While the Samsung Galaxy Note 8 came with an S-Pen, it wasn’t the bright yellow stylus that comes with the Note 9. Aside from the bold colour, Samsung has also equipped it with Bluetooth LE which gives it far greater functionality. For example, you can use it away from your device to manage the camera – making selfie taking a breeze. Camera: The camera hardware on the Note 8 and 9 is almost identical, both have dual 12megapixel rear cameras, however the Note 9 does have a slightly improved sensor to handle low-light shots. Apart from that there’s very little difference, although Samsung claims the Note 9 has better image processing capabilities so your photos should, in theory come out clearer. The Samsung Note 9 LED cover combines beautiful design and function. It protects your Galaxy Note 9 screen from scratches, while letting you stay on top of your notifications, thanks to a clever LED display. GEAR4's Piccadilly case is where art meets smart. This stylish Samsung Note9 cover has a transparent PC back so you can enjoy your phone’s design – while staying fully protected thanks to the advanced D3O shock protection technology inside. The Samsung Note 9 Clear Cover keeps your device protected from scuffs, without hiding its beautiful design. It’s lightweight as well, so you’ll barely notice it’s there. Keep your Galaxy Note 9 safe and snuggly in this Samsung Note 9 Soft Touch Cover. It feels pleasantly soft, and smooth in your hand, and provides a comfortable way to grip your phone. Accessorise while protecting your new Samsung Galaxy Note9 with this stylish GEAR4 Oxford flip case. You can store all of your cards in its compact design, and keep them safe with a practical clasp. And, come movie time, you can prop it up on its own built-in viewing stand.